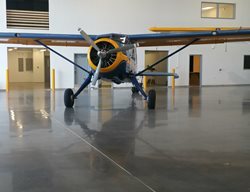 Polished concrete floor - dyed and polished. Read about how this floor was refurbished with polish and dye. 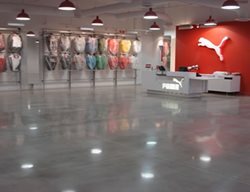 This commercial concrete floor at a Puma retail store was created by grinding and polishing the concrete to a 60% gloss finish. See more of the 2015 DCC Award Winners. 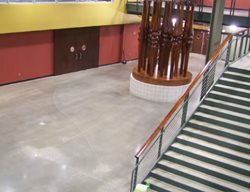 Winner of a 2012 ASCC Decorative Concrete Council Award - First Place Certificate for Polished, Under 5000 SF. This high school now has a beautiful, low-maintenance floor. The project consisted of placing, finishing, grinding, saw cutting, polishing and coloring. Mix design was crucial for this floor because the client had requested that the aggregate show on the surface. Saw cuts, both structural and decorative, help minimize unwanted cracks. Get this look using Scofield concrete stains in terracotta, antique amber, padre brown, and copper patina, Eucosil, from Euclid Chemical, and PolishGuard, from Prosoco. 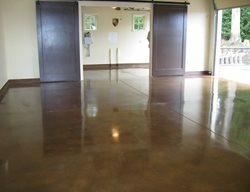 A church multi-purpose room transformed with RetroPlate System (Diamond Polished Concrete) to matte finish (400 grit). Three different acid stain colors were applied (Kemiko's Golden Wheat, Vintage Umber and Black), each square had to be done by hand. This took several days to get the colors and textures just right. 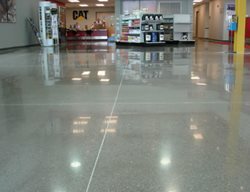 This is a polished concrete job for Quaker Hill Elementary School in Waterford, CT. The areas included a cafeteria and a series of hallways leading from the cafeteria to the main offices near the front entrance of the school. It was all new concrete that was polished to 3000 grit with Ameripolish sealer. The cafeteria had a green and blue checkerboard pattern and the hallways were all dyed burnt sienna. Custom Concrete Solutions was asked to come look at the floors of Smith College in North Hampton, MA. The previous contractors had finished half of the floor very nicely, however the other half appeared to have tape marks left over from a protective covering after they had densified the floors. The challenge was that the marred half of the floor could not be redone without creating inconsistency compared to the good half of the floor. The only solution was to grind and polish all of the floors. CCS started with 40 grit diamonds, running HTC 800's and then up to 800 resins. There were many challenges so it took longer than expected but it was worth it in the end. Just for good measure the floors were re-densified at 400s with Retroplate and finished with 2 coats of LS Guard. These floors will last forever! This project is a polished and stained floor in a residential basement. 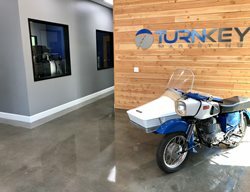 After an acid stain was applied, the owner changed their mind about the color they wanted, so the floor was tinted with a dye. 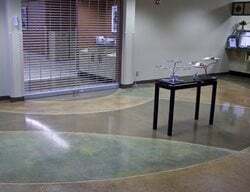 Dye was used instead of additional acid stain because polished floors can not take multiple layers of acid stains without ending up with a very defective polish due to etching. Another challenge was the heavy coating of paint on the floor from when the painters sprayed the wall paint on. 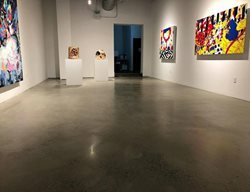 They did not protect the floor, so to avoid having very ugly edges, the edge was stained with a slightly different color and sealed with a terrazzo sealer. It is very subtle, and adds a touch of class to the floor. 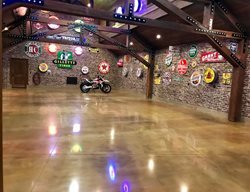 This commercial/residential concrete floor was renovated with a new poured concrete surface which was ground and densified. 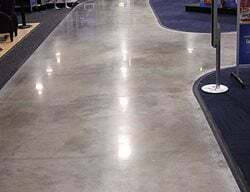 The concrete was diamond polished to a 1500 grit finish for a glossy look and sealed with Versaguard sealer. 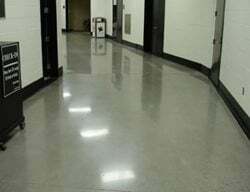 Benjamin Franklin Elementary in Wash. went green with the addition of polished concrete. The light reflective surface decreases energy costs and improves air quality. 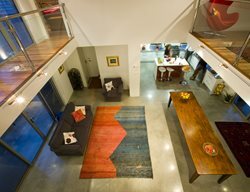 Read about this project and the benefits of polished concrete. 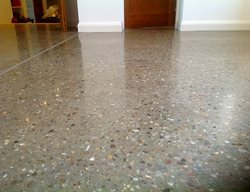 Exposed aggregate polished concrete floor in West Point, NE. 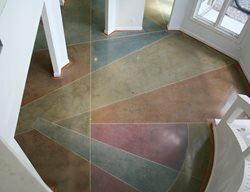 Dyed and polished concrete floor. Read about how this floor was refurbished.